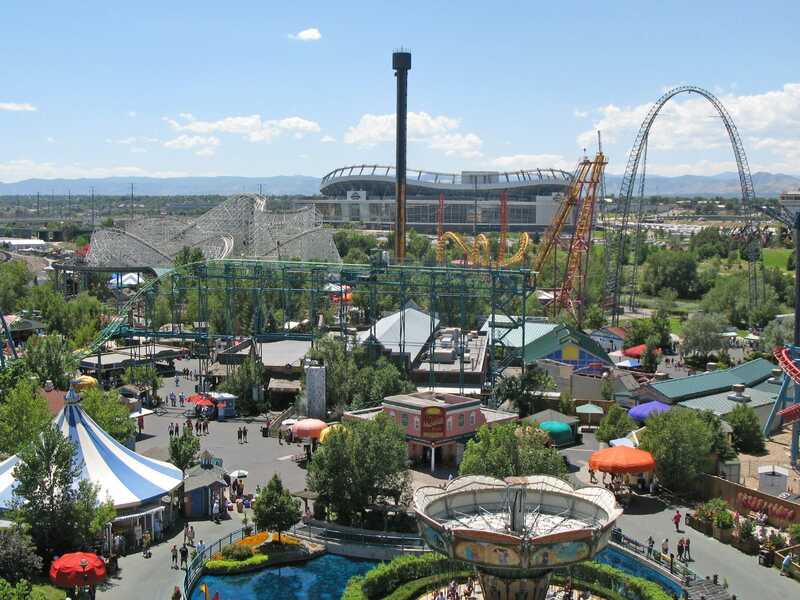 Elitch Gardens is a park that spent a considerable period of its life as a Six Flags park. The ancestry is clearly apparent on approaching the place, when those who have the audacity to arrive by car, obviously a rarity in this part of the world, are relieved of fifteen dollars. The word extortion is the second that springs to mind, followed by the first one; robbery. There's no doubt that parks have to cover their costs, but it is important in my view that there be perceived value for money, and paying that much to park a car does not feel like good value. With a start like that my expectation was for Denver's biggest park to be a let down. Fortunately this turned out not to be the case. It is fair to say that Elitch Gardens is largely devoid of quality attractions, but it makes the best of what it has, with everything being brightly coloured and clean. Unfortunately (or otherwise) the Mind Eraser coaster was closed for major repairs, with a sign outside it indicating it was not going to reopen until next week. The Half Pipe was also out of commission; while we did see it test at several times during the day there was no sign of life at all for the hour or so before we had to leave. That meant a maximum of four new coasters for the day, as the Cactus Coaster was strictly off limits to adults. Quickly ticking off the Boomerang (#1028), we made our way to what we fully expected to be the best coaster in the park, namely Twister II (#1029). Neither of us were brave enough to chance a former Six Flags wood coaster in the back seat, so we settled for the middle. On the whole the ride was fairly decent, though there were a couple of major potholes. Later on we were able to try a front seat and from there it was evident that the ride actually features two trim brakes, both of which to be honest are a very good idea. A little bit of track work might turn this into a top twenty coaster; for now it's certainly rerideable, but not something I'd want to experience more than a few times. Next came Sidewinder (#1030), one of those nasty Arrow launched loop rides that force riders to walk up about several flights of stairs to get to the station. As with most of this genre the best feature of the ride was indeed the station, as the height makes it relatively easy to take some good photographs. We finished the day with the Zamperla torture machine, Flying Coaster (#1031), where once was as predicted more than enough. In the last few minutes we turned our car onto I-76 E, and our wonderful satnav has just made one of those characteristically brilliant remarks that only a computer could utter with a straight face: in five hundred twenty three miles exit right. As I type this sentence we are passing exit seven; we're looking for exit four hundred and forty six.